Distribution of residual contents Mg, Al and Ti in volume of a ladle after inoculation a sandwich-process. Observable regularity of density of the residual contents of elements is connected to irregularity of distribution of sulfur that specifies formation of sulphide inclusions with elements of the inoculation agent. Observable irregularity of distribution of the residual contents of elements of the inoculation agent is connected to emersion of nonmetallics in processes of self-control and a casting of melt of a ladle. Recommendations for the selection of heat-insulating coatings to be applied to a gravity die's working surface depending on casting material and surface requirements have been developed. Temperature coefficients of linear expansion of heat-resistant aluminium alloys D20, AK4-1 and AK12L have been determined for the temperature ranges of 20…100, 20…200 and 20…300°C. Effect of ageing temperature, heat rate of specimen, and methods of processing the experimental data on the value of temperature coefficient of linear expansion has been shown. Tribological characteristics of composite materials on the base of aluminium alloys reinforced by dispersed particles are investigated. It is stated possibility to increase tribological behaviours of composite materials due to complex re-enforcement by dispersed particles with nano scale elements. The article presents investigations of a new type of inorganic binders based on magnesium sulphate. Information on the effect of initial humidity of moulding sand and drying temperature on the strength properties of hardened sand is given. Results of pilot tests of the investigated binder are presented. Dissipation of energy excess during the change of state occurs via formation of lamellar crystals (lamellae) and their organized motion in the solution. Before crystallization starts, the motion of lamellae slows down and the bulk of them dissolves. Increase of concentration of UDP results in decrease of lamellae's size and in growth of their quantity and instensity of the motion. 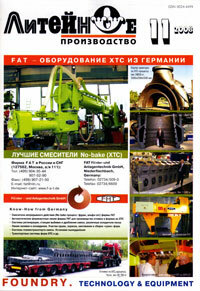 Main results of scientific and research, and applied works PTIMA NASU about high-strength cast iron are expounded. Efficiency of application high-strength cast iron as a unique structural material in different industries of industry is shown. About new high-strength cast iron with complex higher physical, mechanical, special, and progressive technologies of production castings from them are reported.